Zillow has potentially lost or accidentally deleted what appears to be thousands of video walkthrough tours uploaded by subscribers of the real estate technology giant’s “Premier Agent” app, Inman News has learned. The walkthrough data, two-minute virtual home tours used by Premier Agent users nationwide since the feature’s debut on for-sale listings in Feb. 2016 (it was later made available for rental listings), vanished without a trace on Monday — and members of Zillow’s Rental Manager Team warned in an email that the videos may no longer be retrievable. “We have experienced a technical issue that caused us to lose the rental video walkthroughs you recorded,” states the Jan. 8 email, seemingly sent to users of the Premier Agent app. “We are investigating the cause of this error, but it is possible your rental video walkthroughs may not be recoverable. Byron Lohman, a Realtor with Berkshire Hathaway HomeServices California Properties, said he realized on Monday that six video walkthroughs he had uploaded from his phone to his website had vanished. Since 2016, he estimates that he has uploaded as many as 75 videos through the Premier Agent app. His walkthrough videos that disappeared were formerly featured on for-sale listings; he said he has no rental properties in his portfolio. 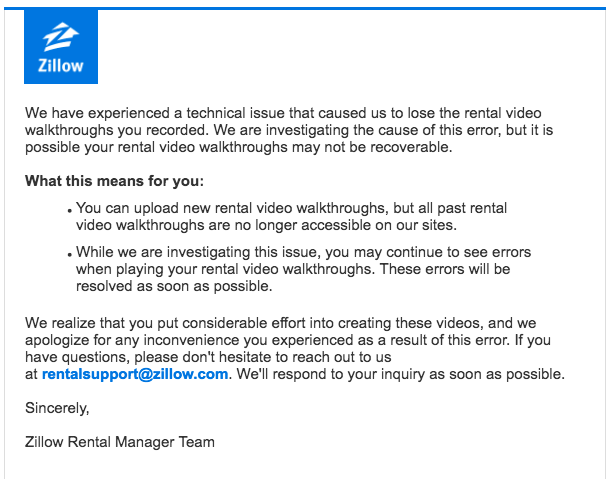 Zillow spokesperson Kate Downen on Tuesday reiterated and confirmed the email sent to users on Jan. 8, adding that engineers are working to restore the walkthrough service videos while warning that the videos may be lost for good. In the meantime, users can continue to upload videos, but they may not be viewable immediately while service is suspended. Downen declined to say how many users may have been affected by the loss, but at the end of 2016 the company boasted 84,151 Premier Agent subscribers. The company stopped reporting its Premier Agent count in 2017 because many of its subscribers represent teams rather than individual agents and therefore distort the figure. “It’s important to us that agents’ and other partners’ experiences are positive ones, and we apologize for the inconvenience,” Downen said in a statement to Inman. Editor’s note: This story has been updated with the most recent number of Premier Agents the company reported.